. : Optics & Photonics Focus :: The Number of Life :. Constants of Nature. Constants of Nature have long fascinated scientists and philosophers alike. What is the reason behind their numerical values? The speed of light (which physicists familiarly call c) is 299 792 458 meters per second, the charge of the electron (e) is 0.000 000 000 000 000 000 160 217 656 5 coulombs, the Planck constant (h) is 0.000 000 000 000 000 000 000 000 000 000 000 662 606 957 Joules times seconds. Certainly, the logic behind these numbers is not what strikes us at first glance. In fact, generations of great scientists have racked their brains looking for any indications of regularity, for any signs of an underlying logic, for any evidence of a set of principles from which these numbers could have been derived. Unfortunately, all efforts have, to date, been unfruitful. What is the meaning of life, the Universe, and everything? 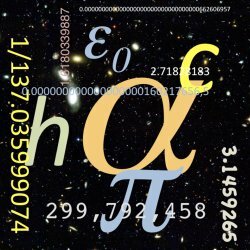 Ask a physicist and he will most likely, jokingly, answer: “42” — the ultimate answer given by Deep Thought, the supercomputer specially built to address this question in the book The Hichhiker’s Guide to the Galaxy. However, a much more compelling answer would be 1/137, give or take, — the value of the fine-structure constant α. In fact, were α to change by a small percentage, life would be all but impossible, our Universe would be totally different, and most of the things we know would not exist. Why does α have this magic value? No one knows. 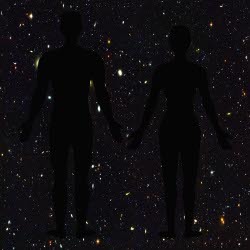 Maybe α varies across the Universe and we are just at the right place at the right time, as pointed out by recent evidence discovered by John K. Webb and co-workers at the University of New South Wales in Sydney, Australia. The fine-structure constant α quantifies how electrically charged particles interact. For example, it governs how protons and electrons get together to form atoms. More in detail, α combines in a pure number some of the most fundamental constants of Nature, namely the charge of the electron (e), the speed of light in vacuum (c) and the Plank constant (h). A bubble in the Multiverse. In the hypothetical Multiverse, Universes with different sets of physical constants may exist next to each other. In all likelihood, only a few of them would present the conditions needed for life to develop and thrive. What would be the consequences of a change in α? If its value were bigger, the electrostatic repulsion between the protons in the nuclei of most atoms would overcome the strong nuclear force trying to keep them together; atoms such as carbon, which constitutes the backbone of proteins and DNA molecules, would never have formed. If its value were smaller, a weaker repulsion between the protons would allow for many more heavy atoms to form, but molecular bonds would also be weaker; complex molecules would simply fall apart at the tiniest shaking. In both cases, life as we know it would never have happened. Physicists and philosophers alike have been fascinated with the reason why α holds precisely its magic value: not too big, not too small: just right. A lot of effort has been focused on trying to establish the value of α from first principles. As Nobel Laureate Max Born once wrote, "the fact that alpha has just its value 1/137 is certainly no chance but itself a law of nature. It is clear that the explanation of this number must be the central problem of natural philosophy." Be that as it may, the actual value of α remains unexplained. No one has been able to derive the value of α from the fundamental laws underlying the structure of the Universe. A trillion monkeys. Even though life is obviously not impossible — after all we do exist —, it is certainly highly improbable in a Universe picked at random from the Multiverse. We can draw inspiration from Luis Borges and perform an imaginary experiment. Take a trillion monkeys and let each of them create a Universe with a random set of physical constants of their choice every single day. How long would it take for them to create a Universe sufficiently similar to ours, in which we could comfortably live? About a trillion years, maybe? That’s a pretty a long time — about 50 times longer than the current age of the Universe. However, it is still far too short. 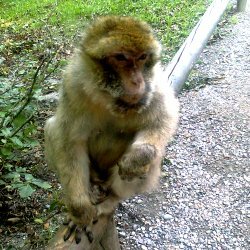 If we believe the current form of string theory, it would take our monkeys the literally cosmic time of almost 10500 years. Some scientists have started looking into other possibilities. Could it be that c, e, h, α and all their relatives were not that constant after all? Could it be that their combination of values is just one possibility more amongst a plethora of other possibilities? To overcome such an impasse, many scientists have been considering the possibility that the constants of Nature may not be all that constant after all. One of the pioneers of considering this possibility is John D. Barrow, now at the University of Cambridge, UK. As Webb recalls, "I spent 1996 on a sabbatical at the University of Sussex, where my colleague John Barrow was working at the time. We started discussing a lot and he got me interested in the subject of the constancy of physical constants. Actually, I got interested from the very beginning, but I didn't see any new directions where the subject could go." When Webb went back to Australia after his sabbatical, he started trying to figure out how he could use the light coming from quasars billions of light years away to make much more precise measurements of α than anyone had done before. 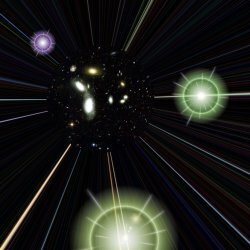 Quasars are the most distant astronomical objects ever discovered, laying at the boundaries of the known Universe, about 15 billion light years away from us. Their light reaches us after traveling literally astronomical distances and collecting information about the matter it encounters. As a matter of fact, not all light reaches us, as the atoms found along the way absorb some specific colors. These absorption lines constitute an actual fingerprint of these atoms’ properties and can be analyzed to find out the exact value of α in these distant regions. "We started looking for a way to analyze these data and put an upper bound on the variability of α," Webb remembers, "but it turned out that we could clearly see that α had a value smaller than the one on Earth." They therefore concluded that α increases over time . The anthropic principle. Consider now the probability that our Universe — the one we inhabit — has a set of constants very similar to the ones we observe. Take a moment to ponder this over. This is not just a probability, but indeed a certainty. In fact, were it not so, we would not exist. This is the essence of the anthropic principle: we observe things as they are because, if they were any different, we would not be here to observe them. Recently, new data has become available. "Now we have datasets from two different telescopes. The Very Large Telescope (VLT) in Chile and the Keck telescopes on Mauna Kea in Hawaii," Webb explains. "We checked the second set to see whether it agreed with the data of '99. Much to our surprise we found out that they gave a different sign of the variation of α. We obviously checked for systematic errors, but we didn't find any." They then noticed that the data showed a systematic spatial variation, which reflected the fact that the two telescopes are pointing to different regions of the sky. "We then fitted the two datasets to a model," Webb continues. "We fitted them individually and we found out that both gave a dipole axis that agreed within error bars. Furthermore, both gave the same magnitude of the variation." Webb and coworkers can now conclude that, within the precision of their current measurement, α appears to be spatially changing across the Universe. Extraordinary claims require extraordinary evidence — as Webb well knows. "When you have got something like this, it obviously needs some independent confirmation before it gets accepted." New information to corroborate or disprove Webb’s analysis might come from radioastronomical observations, which might add some new, completely independent data. Even earthly measurements of α might provide some further insights; in fact, since the Earth is moving through the Universe it might be possible that α might slowly vary over time . Were the spatial variation of α to be confirmed, "the consequences would be dramatic," predicts Webb, "since most physical equations assume constants. If α continues to vary the further away we go, it might never reach an asymptotical value. Maybe this can be an argument in favor of the weak anthropic principle and an explanation why the constants of our Universe are so finely tuned to our needs." J. K. Webb et al., Search for Time Variation of the Fine Structure Constant, Phys. Rev. Lett. 82, 884-887 (1999). J. C. Berengut & V. V. Flambaum, Manifestations of a spatial variation of fundamental constants on atomic clocks, Oklo, meteorites, and cosmological phenomena, arXiv 1008.3957 (2010). J. K. Webb, J. A. King, M. T. Murphy, V.V. Flambaum, R. F. Carswell & M. B. Bainbridge, Indications of a Spatial Variation of the Fine Structure Constant, Physical Review Letters (2011) 107, 191101 (link).